She was suggesting an interactive picture book, one with, say, flaps to lift or pop-ups or unfolding pages. 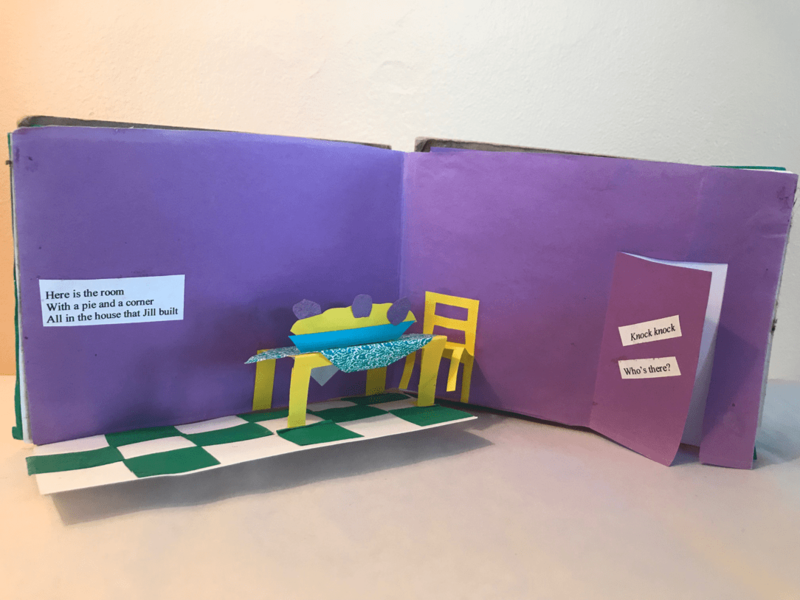 I’d been making lots of pop-up books with my own kids and with their classes at school, so I gleefully sat down with construction paper and tape and scissors to play around with my story. And the story changed. More than changed, it transformed itself: the heart of the story was similar, but the path to that heart was completely new, rife with knock-knocks, fairy tale characters, doors that opened, and a house springing up from the final spread. The published book looks nothing like my little dummy, but I learned that thinking with my hands could be another way into revising a picture book. Now, whenever I have what I think might be a working draft of a story, I take up scissors and paper and tape again to see how I might make the story better. Because I like to see the whole story spread out in front of me, I take fourteen sheets of paper, number them as double pages spreads, cut up my text, and tape the pieces of text down (I don’t worry too much about whether the text occupies twelve or fourteen spreads or about front matter—I just want to know if my story could fit into a 32-page picture book). Soon unneeded words and sentences litter the floor, potential page turns become stronger, and I have a sense of what sort of revision my story might need. I don’t send this dummy to an editor, of course, nor do I expect an artist or editor to see the same page turns that I might envision. I do this dummying for my own elucidation and also to turn loose a part of my brain that operates differently than my writing brain. Dummying up a story teaches me many things, but it also gives me a chance to put aside the hard work of thinking in words and just let my hands and brain play. And maybe, just maybe, to see my story through different eyes.